Elsie Grace (Shehi) Bock, the daughter of George E. and Bertha (Sweany) Shehi, was born August 23, 1926, on the family farm near Fostoria, in Pottawatomie County and passed away March 31, 2019. She was the youngest of 9 children. Her parents; 3 brothers; and 5 sisters preceded her in death. Elsie graduated from St. George High School in 1944 and attended summer sessions at Kansas State University required to get a teaching certificate. She taught 3 years in rural schools in Riley and Pottawatomie Counties. 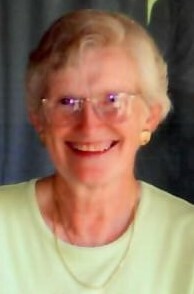 She was active in many community organizations including the Hymer HDU, Elmdale Methodist Church, served as Primary Sunday School Superintendent, church treasurer for many years and UMW. Elsie was also a member of Alpha Study Club, P.E.O. Chapter BZ Sisterhood, Republican Women’s Club and Chase County Artists Guild. Elsie married John E. Bock on May 25, 1947, at the United Presbyterian Church in Manhattan. They began farming in Chase County on the Harry Umberger farm near Hymer. They farmed on Diamond Creek for 60 years. Elsie and John were blessed to celebrate almost 72 years of marriage. She is survived by: son, Curtis (Sharon) Bock of Kansas City, KS; daughter, Gaylene (Tom) Edgar of Arvada, CO; grandchildren, Ryan (Greta) Bock, Rachel (Jason) Bock Dixon, Emily (Chris) Edgar Howard, Anna (Dave) Edgar Stauss, Burke (Tiffany) Edgar; and 9 great-grandchildren. Funeral service will be 2:00 p.m. Thursday, April 4, 2019, at Elmdale United Methodist Church. Burial will follow in G.A.R. Stoehr Elmdale Cemetery. Family will greet friends from 5:30-7:30 p.m. Wednesday, April 3, 2019, at Brown-Bennett-Alexander Funeral Home. Memorial donations may be made to Elmdale United Methodist Church, Presbyterian Manor Good Samaritan Fund or donor’s choice, in care of Brown-Bennett-Alexander Funeral Home, PO Box 220, Cottonwood Falls, KS 66845.